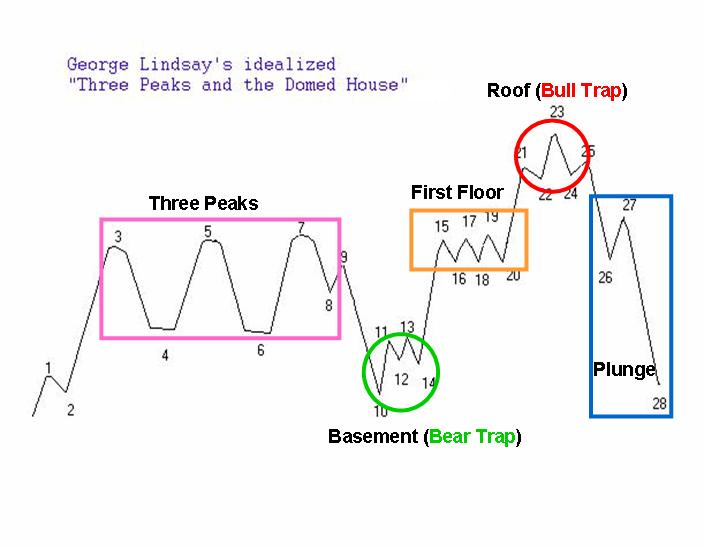 The broad stock market is still in a transition from the “Basement” phase to the “First Floor” phase of the speculated “Three Peaks and a Domed House” pattern. The current short-term bullish time-window should support the advance towards the “First Floor” phase until 12/5/2012. A sharp divergence between the strong Indian stock market and the falling Chinese stock market may put gold/silver going nowhere. The weak Chinese stock market broke down the lower boundary of the 4-months horizontal channel and reached another multi-year low below 2000. It is forming a “Measured Move Down” pattern. The 4-month horizontal channel can be characterized as a corrective phase of the previous sharp decline from 2450 to 2100 (the 1st down leg). Now it just started the 2nd down leg that should have a similar length and slope as the 1st down leg. The downside price target for this measured move is projected at 1700, which is the low of 2008. The gold index has been in an intermediate-term Bump-and-Run Reversal Top pattern since I identified this pattern on gold in my article “How Low Can Gold Go on a Correction?” last August. Currently the gold price is below the “Lead-in Trendline” and it is in the “Run” phase. The falling Chinese stock market may drag gold down to re-test the downside target line. The gold index is possibly forming a 6-month uptrend channel. Although it had a bullish reversal on 11/5/2012, it may be dragged down by the falling Chinese stock market, to re-test the lower boundary of the uptrend channel. The silver index is possibly forming a 6-month uptrend channel. Although it had a bullish reversal on 11/5/2012, it may be dragged down by the falling Chinese stock market, to re-test the lower boundary of the uptrend channel. Although gold/silver mining stocks had a sharp rebound one week ago, they may be dragged down by the falling Chinese stock market to re-test the lower boundary of the 6-month uptrend channel. The following table is the percentage change of sectors and major market indexes against the 89-day exponential moving average (EMA89). The Dow Jones Wilshire 5000 index, as an average or a benchmark of the total market, is 1.03% above the EMA89. Outperforming sectors are Biotech (5.46%), Home Construction (4.56%), and Internet (3.95%). Underperforming sectors are Semiconductors (-4.73%), Precious Metals (-4.19%), and Technology (-1.93%). The S&P 400 Midcap is outperforming and the Dow Jones Industrial Average is underperforming.